If you're in Europe, you can purchase through the Europe shop. One of my kitties is a twist-tie addict. She plays fetch with them, until they get lost under the stove. one of my cats used to go CRAZY over balled up tin foil. whenever we'd move a piece of furniture, there would be about a hundred of them under there. Oh I've never thought of tin foil balls...Must try. that's sweet of you guys to bring his toys with him. Pipe cleaners! wrap them around your finger to make a spring. our kitty sasha loved foil balls too. she'd come running when she heard it. we had another cat would go nuts for the rings of a milk gallon. and of course...never underestimate the power of a paper bag. My kitty Bella loves carton tops too, but i have to watch close so she doesn't eat them... I swear she's part dog. Free, recycled kitty toys are the BEST! My kitty Finn loves the thin plastic rings that come around margarine containers, straws, Gatorade bottle caps, and most other garbage! Our cat, Max loves the rings off a milk jug! But his favorite is when we have fast food. My husband never uses his straw so Max steals it and will play with it for days, in a wrapper or not. i do almoust the same things for my fancy rats xD! Don't forget to look under the refrigerator! My Etta loves anything that she can fetch and have us throw for her, but it always ends up under a kitchen appliance. I can't imagine the amount of cat toys and treats under my fridge. Boo has a habit of batting his treats under there. Isn't that what a human is supposed to do? Melanie is right, foil balls are complete winners, they make my cat go completely feral. When we moved our couch to move house it revealed 8 foil balls, 7 toy mice, 4 pairs of tweezers (why?!) and about 20 pens. Naughty kitty. Crunched up receipts never make it to the recycle bin here...oh! and (clean) Q-Tips. hahah adorable. i need to get ahold of some bread twisties to try this with my sister's cats. Shop pics look great. my cat loves plastic caps, she chases them like crazy. I'm currently being deafened by two 6 month old kittens playing with an amazon box and the paper that surrounded the books. They also like scrunched up foil, crisp (chip) packets tied into knots, sweetie (candy) wrappers and apple cores/plum stones. Their big sis (2.5 years) is looking at them as if to say "Pffft Children", but when she was little, her and her bro (RIP) used to love playing with the same things - but their ultimate favourite toy was a potato. Raw, new potato. It would be batted round and because it wasn't perfectly spherical they had so much fun chasing it. I must show this one to my husband. He thinks i'm the only weirdo who nabs bottle caps and other paraphernalia for my kitty. Her favorite toys are the clear cap covers for squeeze bottles. They are purrfect for her to grab, and make just the right amount of noise - not to mention, they ricochet off of everything nicely. Oh, yeah, it's like that here, too, plus that we have almost every cat toy ever made, and then some. Try a 2L soda bottle with a few tablespoons of soda still in it. It works best if you choose a colored soda and a cylindrical bottle that rolls well (the hourglass Coke bottles don't). Una (RIP) used to play with those for HOURS, trying to get at the little blob inside. I had to put it away at night though, because she liked to whack it across the room, and it can get noisy. 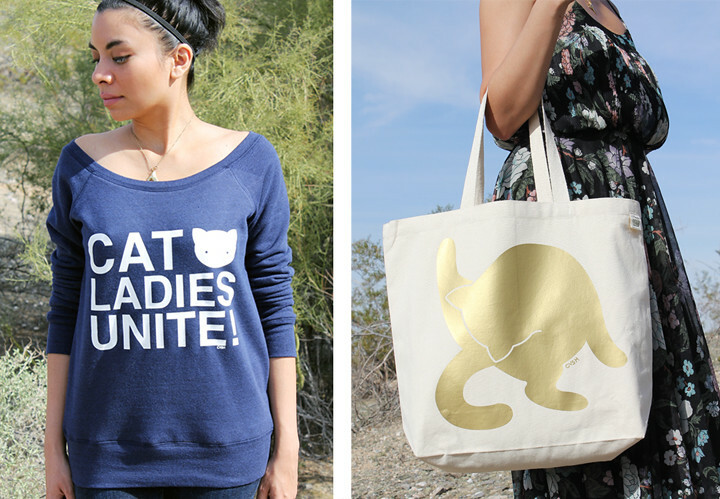 that cat tote is too cute! I <3 your shop stuff! But I live in India... any way to ship here? This is so true. My cats love twisties, carton rings and bottle caps; Especially bottle caps. They always seem to make off with my husbands beer caps before he gets a chance to throw them away, which always leaves me with some explaining to do when guest come over and one of the cats come trotting into the room with a beer cap in her mouth. Me ha encantado la cara de loca que tiene! LOVE this page and your art! My cat, Beans, steals hair ties. He even tries to take them off when you're still wearing them. I had a shiny red twisty tie and I thought my cat was going to faint from excitement when he first saw it. My cats also love to play with coins. I wish the tops came in plus sizes. =( I'd really love to buy one but they're all too small. Oh my god I think you made this one for me! Haha so funny! haha, you make me miss my kitty so much. You have a Europe shop! I ♥ you! I have never laughed so hard in my life. My cats do this ALL the time. And what about Latinoamérica? :) we also love cats. LoL our kitty's love milk caps rings!! !